Single storey, three bedroom, 2 bath cottage, sleeps a maximum of 6, including children over 2 years. The cottage is one house back from the bay in the private residential community of West Indian Beach south of Dewey Beach. It is a short, block and a half walk to the ocean beach. This property is perfect for families with children and/or grandparents or older couples. Central air and ceiling fans throughout. Open floor plan with living, dining (seats 6) and kitchen w/eat at bar. Full kitchen comes complete with dishes/utensils, pots and pans, stove, dishwasher, microwave, refrigerator w/ice maker, coffee pot, toaster and laundry room with washer and dryer. Living room has wifi and cable access, flat screen TV w/DVD player and a small assortment of DVDs. Two bedrooms which sleep 1-2 people each (queen bed and 2 twin beds) and a bathroom adjoin this area. On the opposite end of the cottage past the kitchen is a suite which includes a family room with a flat screen TV & DVD player, a third bedroom which sleeps 1-2 people (queen) and adjoining bathroom w/shower and a small galley kitchen with a bar sink, microwave and under-counter fridge. The suite is perfect for grandparents, early morning risers or those family members seeking a bit more privacy away from the rest of the family. The suite can be locked off from the cottage for smaller families (2 adults, 1-2 children) or couples (2-4 adults) at a reduced price. Contact owner for more information. The cottage is also stocked with a large assortment of good beach reads. Deck with bay views and sunsets has an outside table and 4 chairs. An adjoining patio with a garden view has a picnic table and a gas grill. There is also an enclosed outside shower, a storage shed for beach gear and a clothes line to hang wet beach towels and swim suits. Off-street parking behind the cottage for no more than 3 cars or 2 SUVs. No additional parking available. We built the cottage as our summer vacation home and later built a second home next door when we became year-round residents, turning the original cottage into a summer rental property. Rehoboth Bay is an excellent spot for small boat sailing, kayaking and paddleboarding. Rehoboth Bay Sailing Association is close by for those who want to rent kayaks, stand up paddleboards and sailboats, enroll children in weekly sailing school or for regatta participants looking for a rental close to the sailing club. The bay is also a good place for younger children who prefer a calmer body of water to splash and play in. outdoor shower, Enclosed outdoor shower with changing area. Enough for 6 people, includes plastic dishes for eating outside. Eat at bar between kitchen and dining room seats 3 people. Tennis courts available for rent at Rehoboth Bay Sailing Association. Several public courses within 30 mile radius. Access to Rehoboth Bay from right-of-way for street residents only. Shallow water swimming - perferct for small children to play & swim. Short, block and a half walk (via sidewalks & traffic light) to the guarded, Atlantic Ocean beach. Dewey was recognized in 2014 & 2013 as one of the country’s 13 “Superstar Beaches' for perfect swimming water quality for the past five years by the National Resources Defense Council. Short walk to many area restaurants, casual and fancier restaurants are nearby, as are popular night life spots. Three block walk to the Bay Center complex where every 20 minutes or so, you can board The Jolly Trolley shuttle (fee) for rides into Rehoboth Beach and the boardwalk without having to drive and worry about parking. Rehoboth also has over 140 outlet stores at Tanger Outlets a few miles outside of town. We do not provide bed and bath linens. For your convenience, linen rental and grocery delivery is available from local vendors. Look up: 1) Grand Rental Station, 2) Sheets at the Beach or 3) Concierge by the Sea. Cleaning is done prior to arrival, please observe check-in/check-out times. Beach umbrellas and chairs are available for rent at the ocean beach. Closest airport (1 hour) is Salisbury-Wicomico Regional Airport with service provided by American connecting thru Philadelphia or Charlotte. Other airports within 2 1/2 hours: Philadelphia Int'l, BWI and Washington. The house is very old, but met our needs. We enjoyed the outdoor features- shower, grill, tables. The AC broke during our time but the owner quickly resolved the problem. The ant problem should be resolved before next year. Would stay again! Close and easy to beach. This house was clean, odor-free, and plenty cool enough. We advise paying no attention to an earlier overly critical review. We did not even notice the ceilings because the house was comfortable with simple beach furniture and there are two views of the bay beyond the two houses between this one and the water. Check Google Maps satellite view if you want complete accuracy. While there is a slope to one part of the hallway floor, that’s not uncommon in a beach house of this age. We rented this house because of its location—an easy walk to the beach—and its number of bedrooms and bathrooms, not because we wanted a high-end home with updated everything. There was no need to adjust the AC because the setting at 78 degrees was fine even in the extreme heat and humidity that lasted the whole time we were there. The recommended setting was 78 degrees, but you could lower the temperature if you chose to. We did not feel the need. There were no restrictions regarding sand in the outdoor shower or the temperature of the washing machine water. One thing we were pleasantly surprised by was that there are actually two totally separate living spaces—one (Queen Bed) bedroom is part of a suite that has a private full bath, kitchenette (with its own coffee maker, refrigerator, microwave, and dishes), living room, and separate outside entrance. This house was simple, but totally fine and we would definitely rent it again. So glad you enjoyed your stay. Hope to see you again in the future. Great balance of cost, comfort and location. Thank you for making us feel so welcome and comfortable in your garden cottage. Our family of six adults had plenty of privacy and room to enjoy our vacation. We loved having coffee on the patio and watching the hummingbirds and the bay activity (visible through the large open portico of the owner’s bay front home). The cottage was clean and well appointed/equipped for meal preparation, including a very nice outdoor grill, and the separate master area with kitchenette, bathroom and TV area afforded a nice privacy option. The owner of the cottage, Vickie, was welcoming and gave us all the much needed information to enjoy our stay to the fullest and, while she allowed us the utmost privacy, let us know she was available to answer any questions or issues. 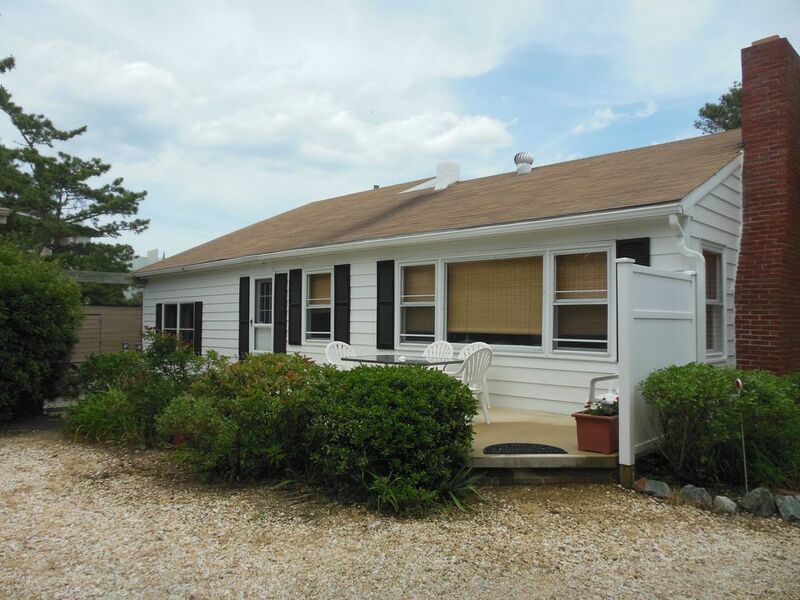 We look forward to returning to this comfy, clean and affordable option for a wonderful vacation in Dewey. So glad you enjoyed your stay with us. Hope to see you again in the future. First i want to say the owner who is 93 lives on the property who is nice but the daughters run the property. When we first walked in the smell of the home was awful. It lasted the whole time we were there. The ceiling drywall has water damage in the main bedroom and living room ceiling is in bad shape. There is a hole in the floor in hallway with a piece of plywood covered by a area rug my 2yr old tripped on 2 times. We were told we cannot touch the A.C. it has to stay on 78. "Note posted " it was 95°outside. She didnt want us to use the shower outside to was sand off, must be done at the beach. Washing clothes only use cold water. "Note posted" We ended up getting a hotel somewhere else for 2 nights out of our 8 day stay. Home is very out dated. Also you are charged for a cleaning when we arived the house was dusty and not cleaned before we arived. I wish i could post photos. I hoped for more since i grew up out east and live in Illinois . We found other homes in the area cheaper and newer. ALSO NOT BAYSIDE VEIW AS DESCRIBED- its on the owners property that you have to stay off of. You can look past her house to see the water but no view! We are sorry that your stay with us did not meet your expectations. Since you did not attempt to contact us during your stay, we were unaware of any of your concerns. description clearly states that the cottage is one house back from the bay, behind the bay front house and that access to the bay is granted through a private easement for non bay front properties. Your negative review does not correspond with other guests, many of whom have been staying with us for multiple years and "can't wait to return." Convenient location, south end of town, away from main road noise and traffic. Unit was clean and ready for check in. Friendly owners, with all questions answered promptly. Was only in town for a weekend wedding but would not hesitate to rent for a longer period. So glad you enjoyed your stay, even though it was short. Perhaps we'll see you again when you can stay longer and enjoy the beaches and all that the area has to offer. Perfect cottage for our family. We had a great time. The cottage was very nice, clean and had all the conveniences we needed. The beach was only about a block and a half away, which we loved. We also rented a pontoon boat and trolled around for a couple of hours on the bay and saw a bunch of dolphins. If we have the opportunity to visit DE again we would definitely love to stay here again! Thank you for your review. So glad you enjoyed your stay and got to spend some time on the bay and seeing the dolphins. Hope to see you again in the future. During the season(June 28 - August 24) we usually rent by the week. We will consider renting less than a week if we have blocks of available dates. During the off season there is a 3 night minimum stay. We require a 50% deposit to reserve your week along with a signed rental agreement. The balance is due 30 days prior to occupancy. If less than 30 days prior to occupancy, amount is due in full. We prefer to rent to families and mature couples. No student /group rentals.